Great Ideas to meet the Riviera Nayarit! We have prepared some Nayarit travel itinerary samples so you can surprise yourself with daily activities and places to enjoy. Simply print these Nayarit travel itinerary samples and get to know more about these incredible Mexico vacation destinations! Book your next Mexico Vacation in the Riviera Nayarit! The Riviera Nayarit has some of the most exclusive hotels not only in Mexico, but in the world. They offer impeccable, discrete service, allowing even the most demanding clients-among them international celebrities and socialites-to fully and confidently enjoy their stay. The scenery is spectacular and there are so many experiences to be enjoyed as a couple that even a quick weekend getaway becomes an unforgettable occasion. Check out this itinerary and pick and choose whatever makes your heart beat faster. 8 a.m.: Wake up, grab a map and take your car, a taxi or a rental-you’re going to need wheels to explore and drive around the Riviera Nayarit and hit everything on the list! Head to Sayulita, it’s time to surf! This sport is trending high and everyone in the world wants to know why. You’ll arrive in about 40 minutes if you’re staying in Nuevo Vallarta-it’s about 25 miles away on highway 200. 9 a.m.: By this time you’ll be pretty hungry, so don’t miss out on Chocobana’s famous breakfast-you’ll need the energy to surf or paddle board. 10 a.m.: This is when you step up to the plate: You may not have planned on it, but taking a couples’ class can be fun, adrenaline-fueled and full of laughter and excitement. In Sayulita there are several surf schools including Luna Azul, Sayulita Surf School, Rancho Mi Chaparrita and Vallarta Adventures. Try standing up on the board, keeping your balance and riding a wave-it’s a unique experience! But if you prefer something more relaxed, get a longboard and a paddle and try your hand at SUP (you’ll still need your balance, though!) It’s great exercise, too, from head to toe. 1 p.m.: Dry yourself off, chill out a bit and explore the beach: there’s nothing better than a long walk on the shore and a quiet moment with your significant other. 1:30 p.m.: You’re probably tired so take some time to relax and grab a bite to eat. There are plenty of places to stop in Sayulita and the food is all good: choose from the international menu at Don Pedro’s or stop at some delicious taco joints like Taco Fish or Burrito Revolución. Or just pick one out on your own! If you simply don’t want to leave the beach and you’re already at your new favorite spot, just enjoy the view while you wait for your food. 5 p.m.: It’s time to walk that food off so head over to the plaza. Poke around the different boutiques-each one has its own style, selling unique and original designs or Huichol arts and crafts. Of course, there are plenty of little bars and cafés to stop in along the way. 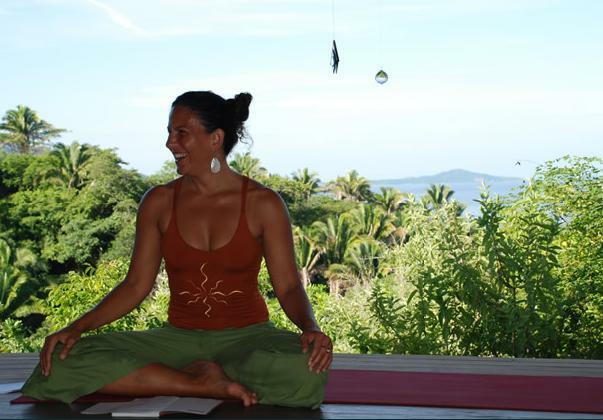 Relax and enjoy the hippie chic atmosphere that made Sayulita famous! 6 p.m.: Ready to go back to your hotel? We’re sure you’ll have plenty of souvenirs and great memories of your first time standing up on a board. 7:30 p.m.: Find some dinner close-by, you’re sure to be tired and you need to recharge your batteries, because tomorrow’s going to be spectacular! Prepare your sunscreen, comfortable clothing, tennis shoes, cap and a backpack to carry all your personal belongings-and don’t forget plenty of energy and a willingness to fly, because today it’s all about the zip line. Pick a tour operator and head out! 9 a.m. The experts in zip lining are Vallarta Adventures Canopy Adventures Park and Rancho Mi Chaparrita. The zip-line is pure adrenaline, giving you the freedom to fly through the trees and feel the breeze on your skin. It comes with a side of climbing, rappelling and walking along hanging bridges… C’mon, you can do it! Noon: It’s time for an all-terrain vehicle (ATV) tour through the jungle. This kind of tour through the mountains has been known to lower stress while bringing you up close and personal with the biodiversity that makes up the Western Sierra Madre, which includes birds, iguanas, rivers and enormous trees to give you shade as you drive by. 1 p.m.: Ready to go back to your hotel for a bite to eat and rest for a few hours? 4:30 p.m.: Explore your senses, revive your soul and relax with your beloved. 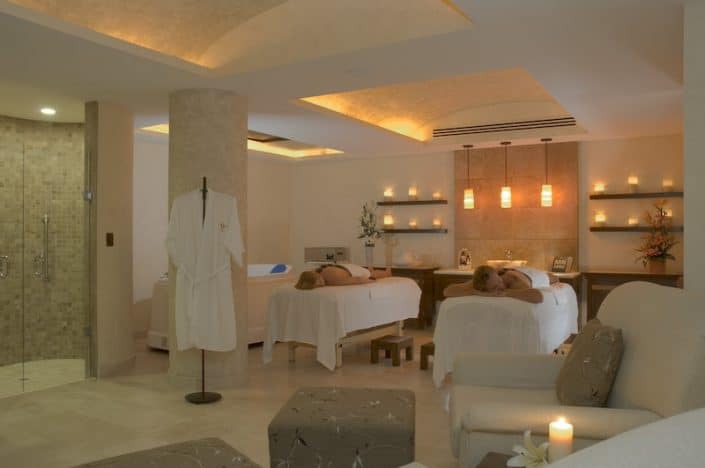 Don’t miss the opportunity to indulge in a treatment at any of the 16 spas in the area http://www.rivieranayarit.com/spa. The techniques are wonderfully varied and you can enjoy them indoors or out. Just imagine the sweet aroma of wood and citrus coaxing you to the ultimate relaxed state, helping you find the balance between your body and mind as you get a massage or sink into a hydro-massage tub. 7 p.m.: We suggest jumping into your car and heading to Bucerías, about 15 minutes away via Highway 200. Hit the beach and wait for one of the most spectacular sunsets you’ve ever seen, then walk back to the center of town where you’ll be greeted by art galleries all along Lázaro Cárdenas street; get to know the Tuna Centro de Cerámica Contemporánea for modern ceramics, check out the Mercado Artesanal for handicrafts and indulge yourself in a piece of art. On Thursdays the main avenue turns into an art exhibit-it’s quite fun, and there are plenty of cafés, bars and intimate restaurants for you to stop in and enjoy a fine dinner. 9 a.m.: You can’t leave without a visit to the Marietas Islands. It will take you approximately 40 minutes to get there if you go with Vallarta Adventures; if you choose Punta Mita Expeditions departing from Punta de Mita it’s only a 20-minute trip. Both are expert outfitters, just take your snorkel, sunblock, bikini and camera, especially if you want to take underwater pictures-don’t forget that no matter what! 10 a.m.: It’s time to jump in the water! When you get to the Marietas Islands dive in: the water is crystal clear (they’re actually three islets brimming with underwater life). This is where you’ll find Hidden Beach, which you can only enter by swimming. The islands are one of the icons of the Riviera Nayarit. Pay attention to the guide’s explanation about the local flora and fauna; if it’s wintertime, between November and March, you might even spot some whales on your way to the islands! Enjoy! Noon: Back on dry land, we suggest a visit to Punta de Mita and lunch at Tino’s, where we highly recommend the pescado zarandeado (grilled fish), one of the area’s most traditional dishes. Chill out for a while on Playa El Anclote, with its crystal clear waters and gentles waves. If you’d rather walk off your lunch, go out and see what the PEACE volunteers are up to or check out the arts, furniture and contemporary arts markets. 3 p.m.: Return to the hotel, get your second wind and freshen up. 5 p.m.: There’s nothing better than ending your day with a sunset cruise around the marvelous Banderas Bay. It is, without a doubt, a must for romance. There are several tours available, just pick the one that strikes your fancy. If you visit during the winter season you may even get to see the humpback whales during their yearly migration-they’re stunning! Depending on the tour you choose, you can enjoy a show, music, snacks and refreshing beverages. 7 p.m.: It’s your last night! Scope out the most romantic restaurant in your area: there are so many options to choose from! Try Italian, Japanese, Mexican or fusion cuisine… Let yourself be swept away by your instincts or your concierge’s recommendations. It’s almost time to go home and wave goodbye to the beautiful Riviera, but you’ll be back… Hopefully with your children! Bon Voyage! As time goes on the Riviera Nayarit has become a favorite for senior travelers. One of the main attractions is its amazing nature, the tranquil ambiance and the many options available for accommodations, entertainment, relaxation and health. In order to play golf and avoid the hottest part of the day you’re going to have to get up early. Your friends will be more than ready; if not, head out alone because you’ll always find someone at the course to play with. 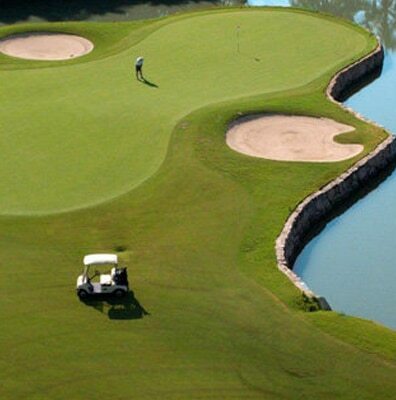 These greens were designed by masters such as: Jack Nicklaus, Greg Norman, Jim Lipe, Robert Von Hagge & Baril and Percy Clifford and all of them can cater to world class golfers. Depending on the level you play (or wish to play), there are plenty of options and it’s the best Latin America has to offer. 11 a.m.: Take a shower and grab your car or taxi and visit San Francisco. If you’re staying in Nuevo Vallarta it will take you about an hour; if you’re staying at any of the towns before Nuevo Vallarta it will be a shorter ride. San Francisco is known as the Riviera’s birthplace of culture, and offers a varied array of activities in order to develop, interact and share that culture through workshops, galleries and interactive activities with the local community. It will be a very enjoyable afternoon. The civil association Entre Amigos, began with a very simple idea: To teach what you know and invite others to do the same. The Alianza del Jaguar is a civil association that promotes the conservation of the jaguar and its habitat. It works in harmony with human endeavors as well, promoting sustainable activities, fair trade, gender equality, respect for cultural and ethnic diversity, human rights and a culture of peace-all activities that encourage community and environmental wellness. The Colectivo San Pancho is comprised of a group of Mexican and foreign artists that came together with the objective of making it clear that art is the best way to change the world. The fourth element is the physical space where these civic organizations come together: the Bodegas Espacio de las Artes. These four civil associations that began to generate what today has become a cultural revolution have united to create the Centro Cultural las Fábricas de San Pancho. This new organization serves as a liaison to direct their efforts in a more integrated way and thus obtain better results when dealing with the three levels of government and sponsors. This also gives their projects more reach, which brings about a better social and touristic impact. 4 p.m.: Visit the La Patrona Polo Club and enjoy a polo match; practice is every Thursday and the games are on Saturdays. You’ll want to visit the galleries and, why not, stop in and see the famous great-grandson of the famous Secretariat. 6 p.m.: Head back to the hotel-no doubt you’ll be quite hungry. We recommend a stop at the Café des Artistes in Punta de Mita. 7 a.m.: Bird lovers will find San Blas is the place to go. This marvelous micro destination within the Riviera Nayarit also offers culture and history. It’s a vast area for watching endemic and migratory birds; it’s the Mexican paradise for birders so jump in your car, taxi or take a tour and enter into their wonderful world. 11 a.m.: Take a tour of the town: the plaza, the church and the Fuerte de la Contaduría, so you can learn about the area’s history through its museum. 12:30 p.m.: Don’t miss a tour of la Tovara, an estuary where you’ll be able to see a great variety of endemic and migratory birds depending on the season. This is a place of mangroves and giant ferns, armadillos, jaguars, turtles and a variety of fish. 1:30 p.m.: On your return to town you’ll need to pick a place to eat: we suggest the Restaurant Garza Canela, the Delfín or Wala Wala. 5 p.m.: Head back to the hotel. 6:30 a.m. – 3 p.m.: Wake up it’s time to go fishing! The Pacific is undoubtedly one of the world’s greatest oceans and is beloved by fishermen everywhere. The reason is clear: the diversity and abundance of fish off the coast of the Riviera Nayarit is striking. Think black and blue marlin, mahi-mahi, yellow-fin tuna and sailfish, as well as smaller species such as roosterfish, several varieties of snapper and wahoo, among others. It all depends on what kind of fishing you enjoy. There are expert captains on call with vessels that include everything from pangas (motorboats) in tip-top condition all the way to first-class yachts. The co-ops and businesses specializing in fishing are located in Nuevo Vallarta, Bucerías, La Cruz de Huanacaxtle, Punta de Mita, Sayulita and San Francisco. The cost of the fishing trips depends on the size of the boat, the length of the trip and the type of fish you wish to catch. 7 p.m.: If you snagged a mahi-mahi or a sailfish you can ask your hotel’s restaurant to prepare it as you wish, or choose from the menu and enjoy the catch of the day before getting some rest; tomorrow it’s time to go back home! Many seniors have made the Riviera Nayarit their second home. There is a list of developers that have focused on offering real estate opportunities to fulfill the needs of these regular visitors, supported by an infrastructure of hospitals, banks, entertainment centers, legal offices and more. Having a second home in the Riviera Nayarit is an excellent option if you want to relive your favorite experiences at your own pace or, of course, you can always stay at one of our hotels. Here’s a list of activities you can enjoy if you stay at an all-inclusive hotel. Noon: the Sea Lion encounter is incredibly fun. You’ll not only learn more about their habits, their reproductive cycles and social life, but you can also interact with them. The kids will love this activity! 1 p.m.: You’ll need to recharge your batteries and eat, because there’s still a lot to do! 4 p.m.: Swim with the Dolphins: They’re back in the destination! You can choose from several different programs that are specifically designed to learn more about these mammals. You’ll also be able to interact with them directly during some of the available swims such as a dolphin encounter, extreme swim, interaction with the dolphins, kids’ swim, private programs for families and even being trainer for a day. 6 p.m.: It’s time to go out and relax a little, explore the town where you’re staying, interact with the locals and don’t leave your camera or your purse, because you’ll want to pick up a few souvenirs and gifts so you don’t forget about us. 7 p.m.: Now for some dinner and a taste of the local cuisine. Try out a traditional spot and see for yourself why so many people love the cuisine of Nayarit. 10 a.m.: Surfing Classes: There’s nothing more fun than trying to stand on a board and run a wave. It’s definitely an activity you have to do with the entire family. You’re kids will simply adore it! There are very capable instructors, usually expert surfers that have their own surf schools. They have the patience, the knowledge and the passion to teach what they love the most: surfing. 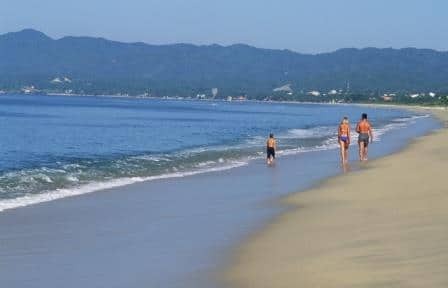 The best place to learn thanks to its gentle waves is Sayulita, though you can find excellent alternatives in Punta de Mita and San Francisco. Here are a few places to check out: Punta Mita Expeditions, Punta Mita Surf Trips, Luna Azul, Sayulita Surf School, Pazport Surf School, El Tigre Surf School and Rancho Mi Chaparrita. Noon: Paddle Board: If the kids aren’t grown and gone yet, then bring them over to enjoy some paddle surf! It’s completely different from regular surfing-in fact the only thing they have in common with each other is that you have to learn to balance on a board. Once you have this down, you’re ready to go and you can enjoy the water, the birds and the company of your kids. Try it for yourself and challenge your kids and your spouse to a race! 4 p.m.: Sand Castles: Be the king of your castle and show the kids how to build a kingdom! You might think it’s a strange suggestion, but believe me, after the surf and paddle classes, this is the best thing to do. 6 p.m.: Back at the villa or bungalow: It’s time to rest, so we highly recommend a siesta. 7:30 p.m.: Dinnertime! We suggest a restaurant where you can enjoy an international or a fusion-style menu. I’m sure you’ll get some excellent recommendations from your hotel or concierge-it all depends on the town or micro-destination where you’re staying. 9 a.m.: You can’t leave without enjoying a sailing sport because the Riviera Nayarit is one of the best spots on the planet to enjoy windsurfing, kite surfing, catamaran and sailboat tours on vessels large and small. Take the helm and take to the seas with your crew (the kids! )-it’s well worth it to rent a catamaran and tool around Banderas Bay. In case you’re not sure about the technique you can always take a lesson or take along a captain. It’s a great experience! Noon to 4 p.m: After sailing around the Banderas Bay you’ll want to add on a visit to the water parks. We have two of them in Nuevo Vallarta: Aquaventuras Park and Splash Inn. In Aquaventuras you jump on the slides (they have 10) and enjoy the Medusa Twister, the Orca Road, the Shark Kamikazy and the Dolphin Jump Race, as well as a ton of pools. As if this weren’t enough, you can swim with the dolphins and watch the sea lion show. Splash Inn offers a fabulous 65-foot tower with slides including Kamikazze, Kamilancha, Whirlwind, Delizzer, Toboruedas, a kid’s area with a shallow pool and kiddie slides-it’s a lot of fun! And don’t forget the dolphin and sea lion shows. 6 p.m.: The day is almost over and this family vacation needs to end with a fantastic family dinner. Savor your food knowing you enjoyed a magical getaway that you’ll surely want to repeat with your entire family. Bon voyage and see you back soon for more adventures! Keeping teens occupied is a big challenge, especially since they want their freedom! What better way to channel their energies than showing them how interacting with nature can give them what they want. 8 a.m.: Time to get up, check today’s schedule and enjoy a good breakfast. I suggest packing insect repellent, your camera and sunblock and wearing comfortable pants or Bermuda shorts with a light shirt and a cap. 10 a.m.: Get ready for an ATV tour: we recommend getting in touch with the experts at Vallarta Adventures or Rancho Mi Chaparrita. An ATV tour will get that adrenaline going, taking you on an exploration of the Western Sierra Madre while crossing rivers and getting to know the area’s biodiversity. It’s great fun for the entire family. Noon: Once in the jungle there’s no escaping the zip-line; these tour operators also offer this service. There are few things more exciting for a teenager than to fly through the tree canopy on a zip-line, rappel down mountainsides or cross a hanging bridge-these are great ways to release all that pent-up energy they have going. 3:30 p.m.: Back at the hotel you can look back through your pictures, relive the experience and and maybe take a nap. 6 p.m.: Visit Plaza 3/14 or Paradise Village to give your credit card a workout; don’t forget to check out the restaurants in the area-they’re perfect for dinner! 8 a.m.: Today is the day to explore the Riviera: each one is responsible for his or her stuff. If you go to Sayulita, your kids will surely clue you in on the fact that it’s the coolest micro destination in the entire Riviera. Musts: bathing suit, sunblock, a change of clothes and your camera. You have to take your car or a taxi; it’s only a 40-minute drive to get there. Noon: Tired yet? You might be, but your kids probably still have batteries left to spare. It’s time to rent a paddleboard! You’ll love this activity. First you have to find your balance, then paddle standing on your feet. It’s not super easy but it is super fun. Have it under control? Now challenge your kids to a race! Good luck! 1 p.m.: Surely the entire family is ready for a break, so pick out your favorite chaise lounge, order a cold drink and enjoy the view; maybe is time to eat pescado sarandeado (grilled fish), some aguachile (spicy shrimp ceviche), fish fingers, ceviche or even a hamburger. ¡Buen provecho! 4:30 p.m.: Before you head back to the hotel walk through its streets and check out the boutiques, you’ll find plenty of surprises and original souvenirs: try Revolución del Sueño, Buddha Gallery, and Galería La Hamaca, among many others. Rent a catamaran and hire a captain to guide you and your family, or take lessons and take turns at the helm. If your kids prefers something more exciting, like kitesurfing, then take them for some beginners’ lessons in Bucerías or la Cruz de Huanacaxtle, where you’ll find several schools. Ask at your hotel’s reception or concierge desk. Afterwards, you can choose to relax or, if you have the energy, head out to a waterpark. 1 p.m.: If you thought waterparks were for teens, you’re wrong, especially if it’s the kind with giant slides and big pools. Check out the Splash Inn with its fabulous 65-foot tower with slides including the Kamikazze, Kamilancha, Whirlwind, Delizzer and the Toboruedas, all in one place. And don’t forget the fantastic pools. At the Aquaventuras Park you can jump on the Medusa Twister, the Orca Road, the Shark Kamikaze, the Dolphin Jump Race, the Barracuda Screw Ball and the famous Starfish Flight or the Jellyfish Slingshot. 8 a.m.: Are you ready to burn off some of that adrenaline? Today is the day, so we recommend having a big breakfast and getting your backpack ready: don’t forget insect repellent, sun block and your camera; wear comfortable clothes, a pair of Bermudas or light camping pants, a shirt, of course, and bring an extra change of clothes in case you get all muddy. 9 a.m. Tour the Sierra Madre on an ATV and share the excitement with your friends. River crossings, mountain trails and nature exploration can be enjoyed through Vallarta Adventures and Rancho Mi Chaparrita; they are very experienced and will hook you up with the equipment you might need. 11 a.m.: Afterwards, consider zip-lining. This is an all-included tour and it’s a can’t-miss activity to enjoy with your friends. Lose your fear of heights and get up on a zip-line. Feel the breeze whooshing past your ears as you fly through the tops of the trees-you and your friends will feel like super heroes! We have the longest and fastest zip-line in Mexico, with nearly 4,000 feet in length and a speed of over 60 mph. And get your arms and legs ready: rappelling is part of the challenge! 1 p.m.: Back at the hotel it’s time to eat and take a nap. You’ll want to recharge your batteries because the evening fast approaches. 5 p.m.: How does a night at the casino sound, with a little bit of poker or black jack thrown in? This is the time to bet on who will pay for dinner, so check out the Grand Odyssey Casino. 8 p.m.: It’s time to head out and party! What to do? Check out the nightlife in Sayulita: First head over to Bar el Mezcalito located on Gaviotas #22 right in the heart of town. It’s a tiny place-in fact, you can’t fit more than 15 people inside-but there live music playing Cuban and Colombian salsa rhythms. It’s a tight fit but don’t worry: the sidewalk becomes a bar and there are plenty of tables and chairs to continue the party outdoors. It’s a great experience… Trust me, you’ll have fun! If you’re looking for the trendiest house music, you’ll love Bar Zen Garden-pretty much your only option in the area. It’s in a two-story building on Calle Marlin. The first floor is styled like a living room, with tables for dining (the menu is Asian) in case you want a bite before dancing the calories off. The second floor has a terrace, low lighting and plenty of rhythm. The night breeze will help cool you down and the sound of the surf blends in with the house music. The ambiance might seem familiar if this is your thing-but you’ll be having all the fun beachside with an international crowd! Bar el Camarón: Located on Avenida el Palmar #100, some qualify their lives as B.C. (before camarón) or A.C. (after camarón). I totally agree (by the way, camarón means shrimp). After a night of bar hopping you can’t miss a visit to this place, which is only open on Fridays, so plan accordingly. You get here on foot-it’s actually a place where you can camp out under the swaying palm trees. The place is basically just a thatched palm leaf roof over a wooden floor with a DJ that plays a selection of electrocumbia, reggaeton, reggae and other rhythms I might not be familiar with but will make you feel great. No matter what they play, though, you’re going to want to dance! This place pays tribute to surfing and its free and easy lifestyle, with lots of suntanned skin moving to the beat and the sound of the waves, because, of course, it’s right on the beach! If the place fills up, no worries: there’s plenty of space and there’s always the sand to socialize with other like-minded souls and enjoy the ambiance, the music, life and all of its good vibrations. 6:20 a.m.: Hung over? Well, wake up because it’s time to set sail! Today is the day to fish, another excellent activity to share with friends. Whether you go for the big game or smaller catches, there’s something for everyone. Try your hand at catching black or blue marlin, mahi-mahi, tuna and sailfish; or smaller species like roosterfish, snapper, wahoo and more. 7 a.m. – 3 p.m.: There are plenty of boats available for rent from the many different docks or marinas-there’s bound to be one near your hotel in Nuevo Vallarta, Bucerías, La Cruz de Huanacaxtle, Punta de Mita, Sayulita and San Francisco. The cost depends on the size of the boat, the time and the type of fishing you want to do; you can choose from smaller motorboats called pangas or head up the chart to a full-fledged full-service yacht. Either way, you’ll have a fantastic experience. 7 p.m.: We invite you to get to know Bucerías: you’re going to love this town. It’s Mexican to its core, from its people and the ambiance to the restaurants, cafés and bars-the latter located on Avenida México. It’s a place to visit for after dinner drinks to discuss who caught the biggest fish. Cheers! The equipment for kite surfing, windsurfing or sailing is available through the hotels or you can rent it right on the beach. There are also specialized schools that can teach you the best technique to follow to ply the waters of Banderas Bay. • Dominant winds: W. Respect to shore: side-onshore Best direction: SW, W.
• Best season: March, April, May, June. • The wind season is from January to June, after that the sea is so warm there is no sea breeze. • It is usually onshore but sometimes swings to the west a little. • The wind is always from sea breezes and is from 5-20mph. • Usually starts around 12-1 p.m. and on a good day continues until sunset 7-8 p.m.
• You can get out 4-5 days a week easily in the wind season. 5 p.m.: You guys will be exhausted; there’s nothing wrong with taking a nap. 8 p.m.: It’s your last night so there’s plenty to talk about, adventures to share and much to laugh about. We’re sure it won’t be your last weekend out with the guys and you’re going to want to come back because there’s much more to do in the Riviera Nayarit. What a trip! Trips with girlfriends are wonderful: there’s so much to talk about there won’t be enough time to get caught up. This is why you travel: to share, talk and do things together, to have the place and the space to truly enjoy your friendship. 9 a.m.: Time for breakfast, the best way to start your day together to discuss the schedule for the day, complete with an ocean view, a gentle breeze and the best company. 10 a.m.: Rent a car and explore the Riviera Nayarit. Your first stop: Bucerías and a visit to the Tuna Centro de Cerámica Contemporanea to check out the contemporary ceramic pieces, tour the mercado for arts and crafts or visit the Casa del Artesano for souvenirs and other works of art; also, every Thursday from November through April galleries open up all along the Avenida Lázaro Cárdenas. You’ll love this village because it’s very traditional, very Mexican. If you’re still there around noon and are feeling hungry, visit Pie in the Sky, where you can nosh on delicious desserts. 1 p.m.: Find your way to Playa El Anclote in Punta de Mita. This is where you can kick back on the sand and go for a little swim. If you choose you can try your hand at paddleboarding; the more adventurous among you can take a couple of surfing lessons. It’s a great day to spend a relaxing time on the beach. 5 p.m.: Ready to go back to your hotel and get your beauty rest for a night out on the town? 7 p.m.: Allow me to suggest a return to Punta de Mita and a visit the terrace at Hotel Cinco; besides enjoying an amazing sunset, you can try out some delicious appetizers while you chat and reminisce about your day. 8 p.m.: The Blue Shrimp is the best place to dine and dance a little; the view is incredible and the ambiance is boho chic. There’s no doubt you’ll have quite the evening. Midnight: Grab a cab and head back to the hotel; you have another exciting day ahead of you tomorrow! 9 a.m.: It’s time for you to get to know Sayulita, a hippie chic town, one of the most famous micro destinations in the Riviera. Have breakfast in Chocobana, take a walk around the town and discover the boutiques, the restaurants and the cafés. Each one is different, we’re sure you’ll love them all. Visit Revolución del Sueño, Buda Gallery, Galería La Hamaca and other shops that offer unique pieces and beautiful designs. Noon: Take Highway 200 and in about 15 minutes you’ll reach San Francisco, known as the Cultural Capital of the Riviera Nayarit. The streets are lined with cultural centers, galleries, different restaurants, artisanal bakeries, cafeterias and the Club de Polo La Patrona, the signature attraction of San Pancho. Get to know the non-profits Entre Amigos, Alianza del Jaguar and the Colectivo San Pancho: you’ll discover workshops, eco classes, grants, books and many other surprises. 1 p.m.: It’s time to eat: choose from Cielo Rojo, Café del Mar, La Playa or Marías-any of them will satisfy any appetite. 3:30 p.m.: Take a short walk around the plaza; it’s good for your digestion. You’ll find Huichol art, murals and many other artistic representations in the shops. 5 p.m.: Visit the La Patrona Polo Club. If it’s a Saturday you’ll be able to enjoy a polo game; don’t forget to check out the clubhouse and the gallery. 6 p.m.: It’s time to take the car back to the hotel and enjoy a great dinner after a magical, enjoyable day. 9 a.m. – 12 p.m.: Girls just wanna have fun! They also want to enjoy an adventure, so we suggest some extreme sports. Feel the energy course through your body: ride the rapids in an inflatable raft; head for the skies, secure your harness and race through the treetops attached to a zip-line; walk on a hanging bridge and rappel down the mountain side. This is exactly what you needed to share-we suggest getting in touch with Vallarta Adventures and Rancho Mi Chaparrita. 1 p.m.: After burning up so much energy it’s time to recharge with a great meal. 5 p.m.: It’s definitely spa time with friends; it’s not only relaxing but also fun. Spas are a great place to enjoy with friends and indulge in some pampering. There are 15 spas in the region, each one with its own particular menu of services and treatments. From great Nayarit travel itineraries to the hottest deals and latest news…have it all delivered in your inbox!